Program Book of APASL STC in Nagasaki can be now downloaded ! Pre-Registration is now available until March 31 (Fri) ! Free Paper Session Program is uploaded! Program at a Glance is updated ! Late breaking Abstract Submission is available until February 28th! Scientific Program is updated ! 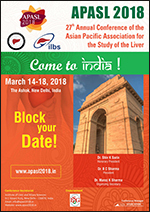 Abstract Submission is still available ! Abstract Submission Deadline has been extended to January 31st ! Early Bird Deadline has been extended to February 14th ! 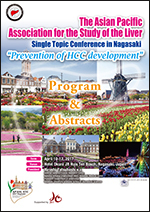 The APASL STC Nagasaki organizing committee would like to express sincere appreciation to the above sponsors and exhibitors. Copyright © APASL Single Topic Conference 2017 Nagasaki. All rights reserved.